A traditional method of cleansing the healing the body. Castor oil therapy has been used for centuries in traditional medicine to promote healing in the body and more specifically the reproductive system. A wool flannel soaked in castor oil is placed on the skin to enhance circulation and promote healing of the tissues and organs beneath. Castor oil is traditionally used to aid in cases with inflammation, pain, growths or to increase circulation. They have a special place to support women’s health. 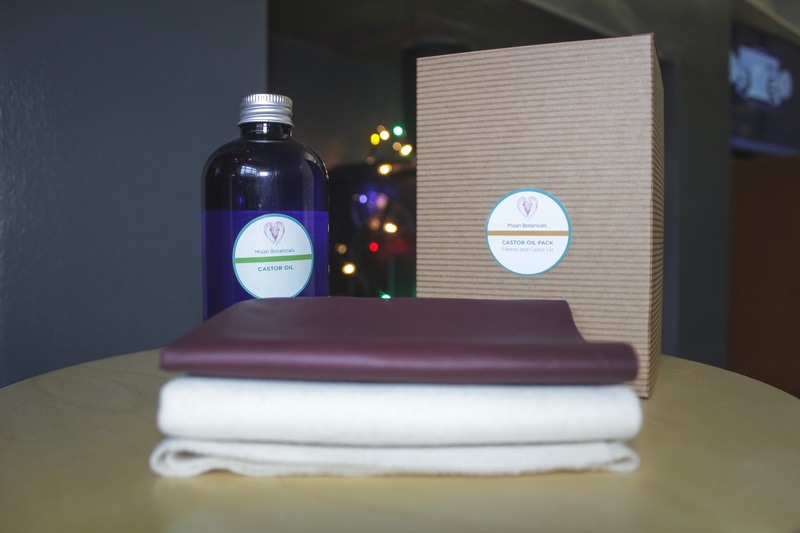 Mizan Botanicals Castor oil pack has everything you need: Organic, cold pressed castor oil; heavy quality wool fabric, waterproof protective cover, instructions for use. If you look after your castor oil pack, it should last for around 30 applications. Most instructions given for castor oil packs, use plastic bags or cling film. Here at Mizan we understand that plastics are xeno-oestrogens that actually promote the hormonal disturbances that we are using the castor oil to prevent. We use this PU fabric to protect against staining as it does not disrupt normal hormonal function, is reusable and does not have the same negative impact on the the environment as plastics.